Our Sept./Oct. issue is on its way to you, and we hope the “cool” cover (pun intended) grabs your attention. Set against that icy backdrop are the faces of Penn State hockey. 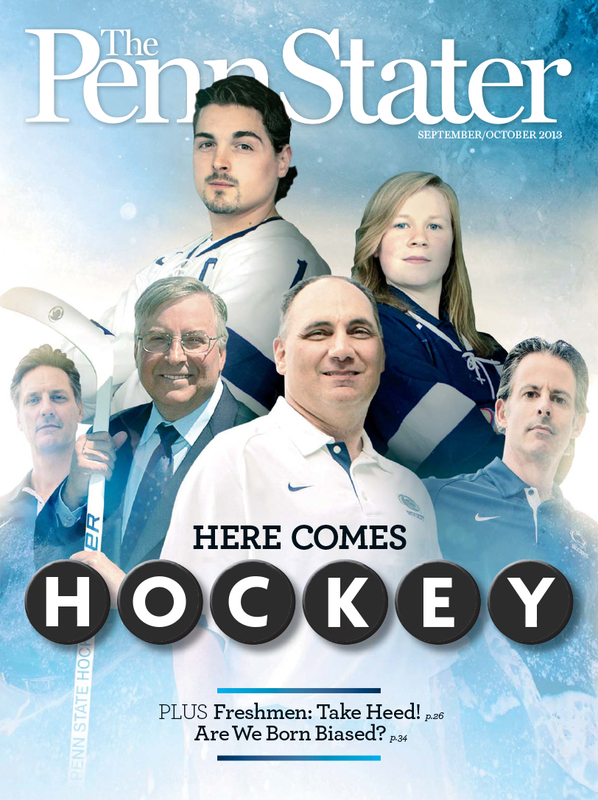 In “Welcome to Hockey Valley,” senior editor Ryan Jones ’95 explains how, after decades of hoping, hockey finally made its way to Penn State. Also in this issue is a fun feature showcasing some Freshman Proclamation posters from way back when (that is, 1904 to around 1950). The Proclamations were rules for new students, written and enforced by the sophomore class. I talked with former university archivist Lee Stout ’69, ’72g about the posters, and he shed some light on the stories behind them—and why embarrassing the freshmen wasn’t the only objective. Some interesting research by faculty member Pete Hatemi is the subject of another feature, titled “Are We Born Biased?” According to Hatemi’s research, everything from our political viewpoints to our choice in romantic partners is influenced by our genes. Other good stuff you’ll find in the Sept./Oct. issue: a profile of science prof David Hughes, who’s been helping Hollywood create realistic zombies; a tribute to the late gymnastics coach Gene Wettstone; an introduction to new Alumni Association president Kay Salvino ’69; plus updates on the Board of Trustees, the NCAA sanctions, and other Sandusky scandal fallout. Once you receive the new issue, let us know what you think. Email us at heypennstater@psu.edu or comment below. Entry filed under: The Penn Stater Magazine. Tags: David Hughes, Kay Salvino, Lee Stout, Pete Hatemi.